Tamako Kitashirakawa: the daughter of the “Tamaya” mochi shopkeeper. Mochizou Ooji: the son of the “Ricecake Oh! Zee” mochi shopkeeper. The movie Tamako Love Story depicts the love between these two teenagers who grew up across from each other in the overly warm Bunny Mountain Shopping District. 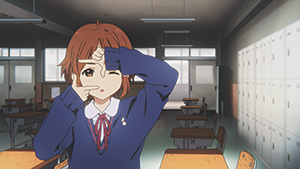 The film, a sequel to the TV series Tamako Market which aired from January to March 2013, has had a long run in theatres due to the support of both Tamako fans and anime fans. Even over a month following its opening weekend, the film is still increasing the amount of theatres its screening at. Thus we’ve come to interview the director of the film, Naoko Yamada, in order to thoroughly investigate Kyoto Animation’s newest masterpiece from when it was first planned until the ending. – How was the reaction at the studio after the movie opened? Yamada: The production staff went to see the film on opening day. The next day I kept hearing “It was so good!” That was the first time I had ever experienced that reaction. I was so happy to hear them. – The staff are the people who are supposed to know how it looks and yet they really wanted to see it in a theatre. Director Yamada, did you secretly go see it in a theatre too? Yamada: Secretly or rather blatantly. (laughs) I wanted to see the film in different theatres, so first I went to Nagoya and then I saw it in Itami. I’ve not seen it in Kyoto yet though. – When I went to see the film, there were a lot of couples and women seeing the film. The variety of viewers was impressive. Did you want to make the film appeal to a greater amount of people than just anime fans? Yamada: I think that’s just limited to what kind of work we made Tamako to be. We wanted it to have many emotions and also go in a direction that was very universal when making it. That’s why I’m really happy that women also went to see the film. – Were there a lot of women seeing the film when you went in Nagoya and Itami? Yamada: There were a lot of them. Couples were also very welcome at those screenings. The boyfriends were making somewhat scary faces as they were crying as the movie ended…. – The boyfriends were really crying? Yamada: I felt like “I did it!” (laughs) They looked like they came just to accompany their girlfriends, so I’m glad the movie was able to touch them. – Those boyfriends may not have seen the TV series and yet this is a film that even they could enjoy without any problems. I’ve also recommended it to my friends who know nothing about Tamako and heard rave reviews afterwards. Were you consciously making a film that you could enjoy by itself? Yamada: Yes. When I see a movie and there are things that I don’t know in the plot, it leaves me behind and feeling confused so I focused on that aspect when making this film. Also, there’d be people who love the series recommending it to everyone around them and those new viewers would be confused when watchin. It was very important for me to make the movie something for people who haven’t seem Tamako or aren’t familiar with anime. – In Tamako Market, Tamako herself daydreams about mochi and the shopping district. It seemed unlikely she would fall in love. And yet this film is a straight love story like the title says it is. Was a love story a theme that interested you beforehand? Yamada: Honestly I wasn’t interested in it beforehand, but when we were making the movie my interest in seeing how the love-ignorant Tamako would fall in love immensely grew. This isn’t a story about how two people meet for the first time. I think anyone who sees 10 minutes of the film would understand that. – However, did you have troubles making the shift from “Mochi-life” Tamako and “Lazy, Loving Tamako” Mochizou to develop the love story plot? 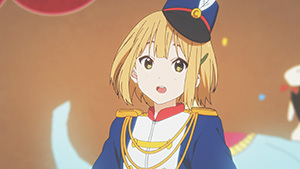 Yamada: At first I felt the plot was all a jumble, but as it began to be sorted out, I noticed that the gap between Mochizou and Tamako was incredibly fascinating. Things like their houses facing each other, being childhood friends, and sharing a string phone in their rooms might seem annoying, but it felt so charming instead. Still, it was incredibly to think how Tamako would react to Mochizou’s confession. How would a girl who’s been watching and working in mochi fall (in love)…… I talked about so many topics with scriptwriter (Reiko) Yoshida-san about it. – It feels like the story starts to move forward once Mochizou says “Tamako, I really really love you!” Did you ever feel imagine that expression from Mochizou during the TV series or did the lazy Mochizou grow up too? Yamada: Well… Ah, right. I never thought of Mochizou as being lazy from the very start. That’s why I didn’t think his confession was out of the ordinary. -He did take the direct approach a few times in the TV series though Tamako completely ignored those attempts. Yamada: Right. They were quite splendid approaches too. This attempt was a much more easier to understand approach. That’s why it made me really happy. – Does it feel like you’re saying “Sorry Mochizou~” for the TV series? Yamada: Both the surrounding staff and I were really getting impatient. People were worrying so much they started to recommend he start a relationship with Anko (Tamako’s sister) instead. (laughs) However I consistently supported Tamako and Mochizou, so it felt good to carry out my original intentions. After getting close to the characters, what’s the best option for them? 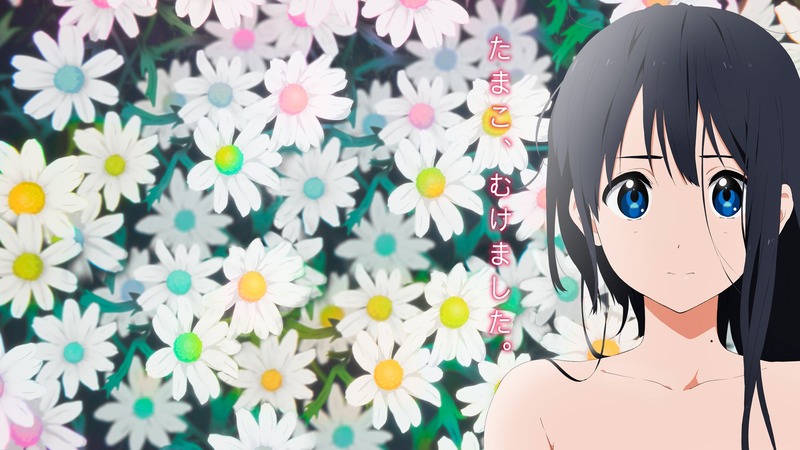 – Did anything change from the TV series in how you depicted Tamako? Yamada: I think you get closer to Tamako and sense that she’s a girl through and through. When thinking about it, we were able to display what her philosophy on life is. – Philosophy? Like what’s important to her? Yamada: Like the aesthetics of Tamako. How do you make her into the type of girl who’s important to everyone around her and yet not make her unlikable. We had to dig again and think how to make Tamako into that kind of girl. Tamako’s important not just to Mochizou, but to (her friend) Midori as well. Not showing why she’s important to those two wasn’t an option. Yamada: Yes. Along with the images, that was the most important part I worked on. Of course, excluding the scenario. – When Mochizou confesses to her, Tamako’s eyes go googly, her speech becomes cluttered, and she runs away. Was this the image you had in mind previously when he would confess to her? Yamada: I really thought about it a lot. It took a really long time to discover what Tamako would do. The storyboards for that scene just wouldn’t advance any other way than little by little. “And what is Tamako’s reaction?” “Now how does Mochizou react?” Little by little I pieced the scene together while choosing my options and crunching on Yoshida-san’s messages in the scenario. What’s the best option for each of the characters as the audience gathers close to them? I considered how to depict the two without making fun of them both. – Was it Yoshida-san’s idea to stick in older movie lines like Tamako’s “I’m very flattered”? Yamada: We talked a lot about that during the scenario stage. Regardless we seriously contemplated what Tamako’s reaction would be to being confessed to. Obviously she wouldn’t be cold to Mochizou, but she was already running away. (laughs) At that point we wanted something that she could run away with and yet leave some fear. She was raised among all the people in the shopping district, so there’s probably some pieces of information she picked up randomly. – Still, that’s quite an old way to say it. (laughs) After that, she runs back through the shopping district engulfed in their lights without any greetings to the shopkeepers. She greets them without fail everyday though. I thought that direction was splendid. Yamada: I considered what was the best way to show that this was a major event for Tamako. – Tamako didn’t go through any major events in the TV series, right? 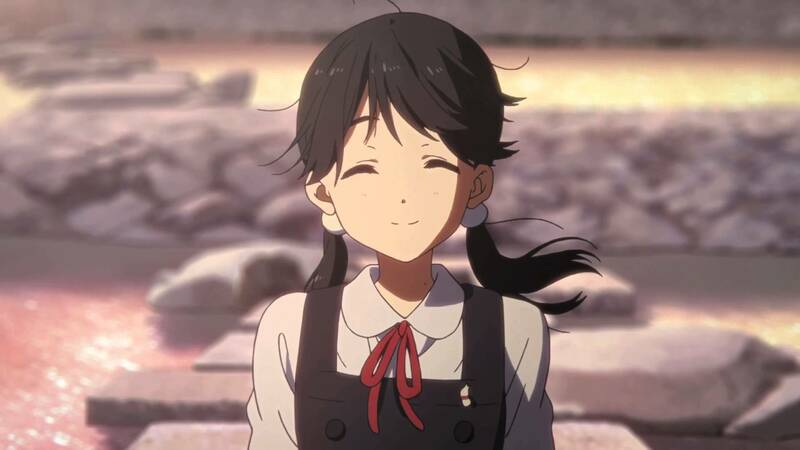 Yamada: During other people’s big events, Tamako would just say “It’s alright.” But even when her own event is going on, she’s still a normal girl, so even as her emotions are fluttering, she still has that happiness inside. -It felt like happiness was tucked inside the lights around Tamako. Even though she wasn’t aware of it, it felt like a happy mood was alive inside her. Yamada: Tamako is always tucked inside many signs of happiness. I thought it’d be nice to show that kind of scenery. – Though the film depicts a love story between Tamako and Mochizou, there’s probably a lot of fans who were worried about Midori…. who seemed to have feelings more than friendship for Tamako. Or perhaps it’s just me. (laughs) But it seemed you handled Midori quite carefully in the film. Yamada: Thank you very much. What was the question? Yamada: That was excellent! We planned it like that. We wanted Midori’s emotions to be involved, but furthermore, we wanted to be able to do it without messing up our development of Tamako. 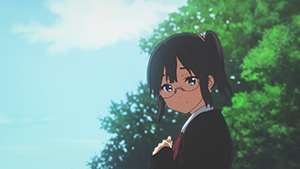 It seemed like if we worked on Midori, then we couldn’t develop Tamako. I wanted to rescue her…. And then Tamako’s depiction worried me. – Was the development concerning Midori important to you? Yamada: It feels very rough like it’s a thorn from adolescence that she’s carrying around. She’s very much the kind of girl who would carry around something feminine like that. Very humid. That’s really the most charming aspect of her. She’s gloomy. Sharp. And yet cheerful. That’s what’s so fascinating about her. – There’s a certain emotion inside her, yet she doesn’t know how to express it. Yamada: Right. She doesn’t know. Not one bit but…. – She doesn’t appear to be disagreeable! Yamada: Right! It was very important that she never appear to be disagreeable. Yamada: That’s perfectly fine. (laughs) I’m happy to hear it. 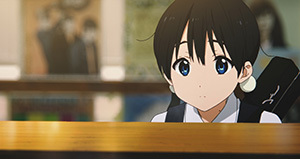 – In the first half of the film, Mochizou looks at Tamako. 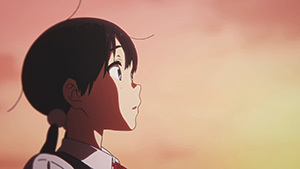 After he confesses, Tamako starts to watch him. Mochizou doesn’t seem to change any of his actions after he confesses. Yamada: When I hear it summarized like that, it sounds like such a simple story. He confesses and then got that strange response of how she feels. Of course he becomes anxious after what she did. (laughs) I’m really happy I got to produce that kind of work. – Since it’s simple, you wanted to create a straightforward love story? Yamada: Personally, I love very simple tales but I felt there’s times you can’t have a movie without some kind of tricks and turns for the audience to enjoy the ride. I was constantly worrying about how to fit them together. In the end the producer and Yoshida-san helped guide me towards the simpler story. 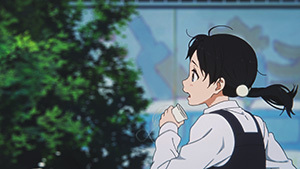 – It was a bit shocking to see that her grandfather was hospitalized while Tamako was sorting through her feelings after being shocked after Mochizou confessed. Yamada: When I saw that he had fallen I was also surprised. Yamada: My nose was dripping as I was reading the scenario. (laughs) But as I was thinking about Mochizou and Tamako’s relationship up to that point, there really hadn’t been any big events happen or any changes. Also I wanted to show a strong and cool moment for Mochizou too. Something that would have the right timing for Tamako to finally see Mochizou. 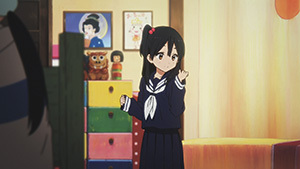 – There were a lot of props that returned from the TV series like the string phone between Tamako and Mochizou’s rooms, but they became key items in the story. Yamada: If we were to go back to Tamako Market, I think there’d be a lot of small items that show that hint of love between the childhood friends. There’s many items that could be used here that weren’t used to their full potential in the TV series. The string phone is one of them. It had a different motif originally, but now we advanced its meaning to build upon the older analog, not digital, way for the two to communicate between each other. – So, was the story behind why Tamako began to love mochi the same as the image you had in your head during the TV series? Yamada: Yes. As I thought about various things, I began to like the events we had constructed for their pasts. There were events that got the character designer (Yukiko) Horiguchi-san excited as well. – Were there any parts of Tamako’s home life or in the shopping district that changed from the TV series? Yamada: They’ve pretty much stayed the same. The colors for Tamako and her family have been slightly altered to bring out the depth in the characters, but nothing’s changed color-wise for the shopkeepers. The artwork (backgrounds) have also been altered (in order to fit the bigger screen) to give it more of an amusement park feeling. I wanted people to realize the balance between the important school portions and the happy euphoria from the shopping district. – There was nothing changed about the characters? Yamada: Right. The shopkeepers haven’t changed a bit. It’s because of that that Tamako can pass time comfortably in the area. However, after she was confessed to, she becomes worried and starts to stroll through the shopping district where she gradually hears some married conversations she never heard before. – In the TV series, there weren’t any kind of intimate conversations going on in the area. Yamada: There probably were those kinds of conversations constantly going on in the area and Tamako likely heard them, but didn’t give any deeper thoughts or meanings to them. Since a new room in her has been opened, she now starts to hear them. 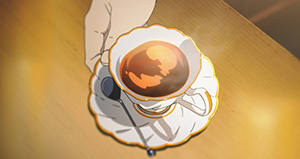 – Near the end, there’s a scene at the train platform when Tamako conveys her feelings through the string phone to Mochizou and the screen turns dark black while the audio plays her “I love you Mochizou” through the cup. I think there’s a lot of guys who felt their heart skip during that part. What was your aim during that scene? Yamada: Probably to do whatever she could at that moment. When she thought about Mochizou, that’s the feeling that came to mind for her spontaneously. 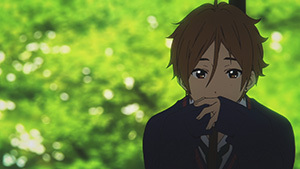 – During that scene, after hearing her confession, Mochizou casts his head down where his hair covers his eyes and mouth. 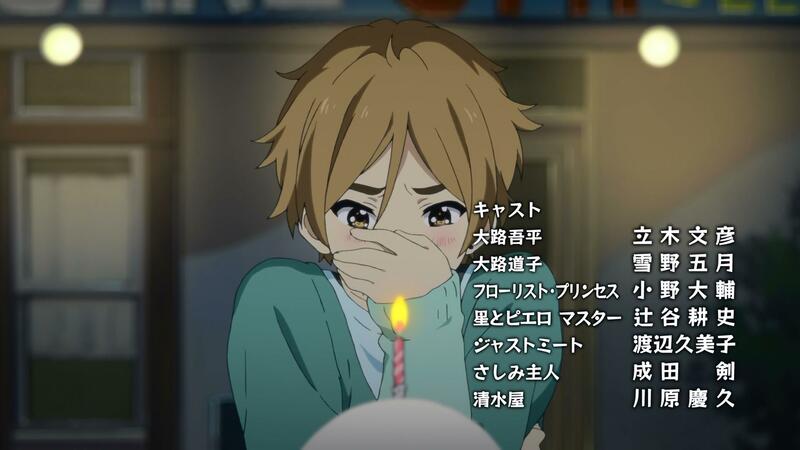 That’s the same action he did in episode 9 of the TV series where Tamako gives him a birthday cake, isn’t it? – I thought him not striking a pose or holding her felt very much like Mochizou. When you think about Mochizou, doesn’t that image of someone who couldn’t do those things come to mind? Yamada: It definitely feels that way. (laughs) His reaction in episode 9 was something drawn by the storyboarder/director (Ichirou) Miyoshi-san though. When I first saw it, I felt that gesture was incredibly Mochizou-ish. It shocked me. I very much love that scene. – So you used that gesture here? Yamada: Yes. I don’t think Mochizou would react any other way to being confessed to. – Does it feel like that last scene where their feelings are communicated between each other, Mochizou’s endurance, Tamako’s worrying, etc, was something you had solidified early on? Yamada: It surely feels that way. My main interest in this particular project was the process by which Tamako fell in love. This ending felt like it was inevitable. – After seeing the film, I would guess that you would prefer shounen manga over shojo manga. Would I be correct? Yamada: I’m certainly not that familiar with shojo manga. As I was collecting data for this theme, it was called “shojo manga-ish” so I had to ask over many times “what about it feels so shojo manga-ish?” (laughs) I’ve read a lot of shounen manga. My older sister keeps a lot of them. – Ah, then it definitely feels more like a shounen romantic comedy. It follows the trend of slapstick up until the point where it stops at the end as they overcome their struggles and become a couple. Yamada: Now that you say it like that, you’re right. – While shojo manga have the couple begin to go out as well, there’s also more disagreements/missed points depicted…. Yamada: Like when a rival shows up? You’re right. I’ve definitely read a lot of shounen romantic comedies. That might be why I had so much fun with Mochizou. Ah, but people watching him may think of him acting somewhat feminine. – So what do you feel is the special part for character designer Yukiko Horiguchi-san? Yamada: I’ll say something I think she’ll really hate me for saying and try to run away from it, but I think she’s truly a prodigy. I think the way she makes her characters act is so amazing. They never get caught up in mistakes. The way she draws her hands and their actions are incredible. Her fingertips aren’t useless in the slightest. – I understand what you mean. Yamada: I’ve thought she’s been amazing for quite a while, but I wasn’t able to say what was amazing about her until now. Once I came to the conclusion that her charm was “the way her characters are so supple” it finally hit me. – With the story being very simple to make, was it a pre-requisite for you to have Horiguchi-san’s image abilities to complete the tale? Yamada: Yes. I have absolute trust in her. – One of the important characters in the TV series, the talking bird Dera Mochimazzi doesn’t appear in the movie itself, but he does appear in the short “Dera-chan on the Southern Island” that screened with the film. He’s as goofy as ever. Though he’s important to the story as a whole, it was a marvelous idea to keep the movie as simple as possible by splitting him off. Was this your idea as well? Yamada: Disney movies have that short cartoon at the beginning of their works, so I thought about those images in my head. However the movie was constructed without Dera-chan appearing in it. As I was thinking of how to get him to appear, it suddenly occurred to me, “Ah, we can make a short!” I was so happy we could make both stories into one piece so he’d appear. – Was there anything related to this film that you absolutely wanted to include since it was going to be a movie? Yamada: There were a lot of things I wanted to include in this film, or more specifically into a love story itself. From the viewer’s side, there’s a lot of emotions that are jumping around that they have to feel, so I felt it had to be a single movie in order to tell it in one go. For this film, I constructed the visuals in order for the audience to feel those wavering emotions/thoughts. Thus I wanted to do everything: the layouts, the direction, each single cut, everything. It was a long process ever since we started drawing, but I think there were some amazing drawings this time. Yamada: Right now it feels very refreshing. It was incredibly fun to depict how love starts to bloom in someone and to experience that for the first time. I never thought I would’ve become a love story author previously, but this has been a very good experience. – You weren’t aware of them previously and yet you were able to create such a straightforward love story. Looking back, were there any surprising moments for you? Yamada: There were certainly some “ah” times. (laughs) A while ago I helped direct a show, CLANNAD, that was fully a love story, but at that time it was so much fun directing. Yamada: I was worried throughout working on Tamako Love Story, but I had drawn storyboards for CLANNAD. When I first saw them, I was shocked. “I can do something like this too!” I never thought I would be able to direct/storyboard. – And then you became a full director in a blink of an eye. Was it embarrassing to work on a straight love tale? Yamada: Yes because I kept saying “Idiot! What are you doing? Stop putting your own memories into this movie!” (laughs) From that I ended up thinking that it would be a good thing when I was embarrassed working on it. I’m glad that I was able to miraculously draw those storyboards from long ago. For some reason I became overly self-conscious during this, so because of them I was able to thoroughly depict how Tamako and Mochizou fell in love. – It’s definitely that kind of work. 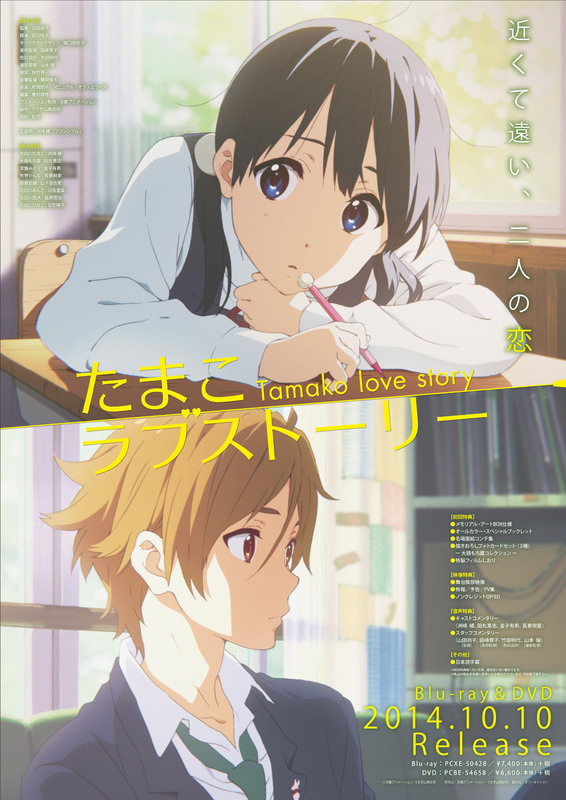 Finally, what kind of work is Tamako Love Story to you? Yamada: It feels like it’s a very important work. It feels like everyone; Mochizou, Tamako, Midori, Kanna, Shiori, Anko, takes a step forward and you’re always there to see it happen. – For 83 minutes long, it’s quite a dense movie. Yamada: You wouldn’t think everything could happen in that length of time. Even the onlookers don’t think it was possible, but I’m truly glad we could fit everything in it. This entry was posted in Kyoto Animation, Tamako Market, Translations and tagged interview, love, naoko, Story, tamako, Translation, yamada. Bookmark the permalink.